A proponent of investor protection and financial literacy, Julie Jason is an award-winning columnist and author who shares insights gained from a lifelong career in money management and law. 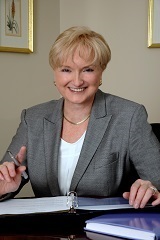 Syndicated by King Features, her weekly column is a CLARION Award winner and has been recognized by the IRS for “accurate, timely, informative and helpful tax information,” as well as the Society of Professional Journalists (CT Chapter) and the Connecticut Press Club for "Excellence in Journalism." Julie's books share her insights on how to make sound financial decisions in all types of markets. Please don't hesitate to email her (readers@juliejason.com) with questions that can be addressed in the column. She often meets with readers whose situations can help illustrate important financial lessons for other readers. Would you like to see Julie Jason's column in your local paper? Please ask your local newspaper editor to contact King Features for samples and rates. Email Rebecca Haase, syndicate sales, at RebeccaHaase@hearst.com. Or, write to us at readers@juliejason.com.